Four Door Wardrobe with 2-Jumbo Drawers. Includes 2-Shelfs and 1-Hanging Rod. Strong Construction. Easy to assemble. Made of Melimen with Scratch resistant qualities. 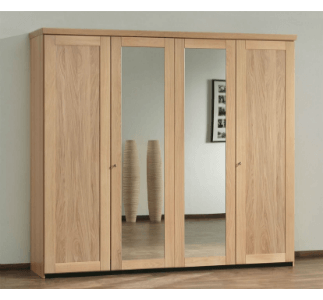 Available in White, Black, Beech and Mahogany Finish.Also Available with Full Mirror Front with 2 long Doors (No Drawers). -Detailed and easy to follow instruction manuals with large and clear images of the assembly process. -Consumer assistance includes free shipping of replacement parts and hardware, assemly help over the phone or via e-mail .Size: 48 In. (W) x 20 In. (D) x 72 In. (H) Wood Type Information Click HereMade In The USAQuantity Discount Available. 3-Door & 4-Drawer Wardrobe In Light Cherry. Beautiful Design And Strong Construction. Easy To Assemble. Dimensions: 48 In. Wide. x 22 In. Deep. x 85 In. High. Two Door and Three Drawer Wardrobe. Comes ready to assemble. Strong pressed wood construction.Size: 33 In. x 22 In. x 72 In. (H)Normally Ships in 1-2 Business Days. Discount Available For Product and Shipping For Large Orders. Two Door and Three Drawer Wardrobe. Comes ready to assemble. Strong pressed wood construction.Size: 32 In. x 22 In. x 72 In. (H)Normally Ships in 1-2 Business Days. Discount Available For Product and Shipping For Large Orders. Wardrobe with 1 Hanging Rod and 4 Shelves. The Shelves are adjustable. Available in Light Cherry,Coffee Bean and White. Size: 16 In. (W) x 16 In. (D) x 65-1/3 In.(H). All Measurements Are Approx. 2 Door Wardrobe with Hanging Rod and Shelves. Available in Coffee Bean, Light Cherry and White. Size:24 IN. (W) x 16 In. (D) x 58 In.(H). Discount Available For Product and Shipping For Large Orders.